What do you get when you mix together the biggest stars of the day, a top-notch director, a flawless production team, timeless songs & the juiciest 'story behind the story' Bollywood has ever known? 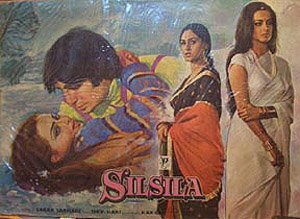 One of the biggest and most expensive flops in the history of Indian cinema - the now classic, 'Silsila', originally released this month in 1981. Why audiences stayed away in droves is still a matter of debate today. The songs themselves were on top of the charts months before the movie came out. Plus the movie was coming from Yash Chopra Films (which already had superhits with 'Kabhie Kabhie' & 'Kaala Pathar'). Was the story on screen too close to what was happening off? A case of life imitating art a little too well? For those who don't know - the rumor of an extra-marital affair between Amitabh Bachchan & Rekha was Bollywood's worst kept secret well before the movie was released. In the movie, Amit (Amitabh Bachchan) & Chandini (Rekha) fall in love only to see their relationship shattered due to a family tragedy. Amit is forced by tradition to marry his deceased brother's wife Shobha (Jaya Bachchan) because she is unwed & a soon to be mother. Jaya & Amitabh of course, are married in real life as well. Although Amit marries Shobha - his heart still belongs to Chandini & an affair (Silsila) between the two then makes up the bulk of the movie. Watching the movie today one cannot help but think what must have really been happening behind the scenes. Is the passion Amit feels for Shobha real - and vice versa? Watching the reactions on both women's faces when Amit is singing 'Rang Barse' while drunk makes the scene incredibly difficult to watch. The scenes between Chandini & Shobha when they confront one another are subtle yet incredibly powerful. It is at that moment that it hits you - that these 2 women aren't really acting anymore - they are just saying things to eachother on the screen that they could not say off. The songs were written by the team of Shiv/Hari in their inaugral film. Shiv Kumar Sharma (santoor) & Hariprasad Chaurasia (flute) were already accomplished classical musicians in their own right before composing the tunes for 'Silsila'. The movie opens with 'Sarke Sarke', a Kishore/Lata duet in which we see Jaya looking radiant with her fiancee (Shashi Kapoor), watch it here. However the 2 songs (also sung by Kishore/Lata) on the radio.blog are the Amitabh/Rekha ones... The 1st one, 'Ladki Hai Yah Shola' takes place when Amit & Chandini initially meet and find they are attracted to one another. The 2nd one however, is the true show stopper. It is actually a dream sequence between the two filmed in a tulip field outside of Amsterdam. Both stars (without Jaya) and the crew were flown to Holland specifically for this song. The lyrics, music & rendition of 'Dekha Ek Khwab' make it a true classic. It can be seen here. wonderful account of the great movie.Iam inspired , I hope to get a copy in my CD shop . Fascinating context. I was completely unaware of the rumours before reading this post. I HAVE to see 'Silsila' now - great review. Makes watching some of their other movies more interesting. Every time there is an awards show & Rekha gets an award - the camera instantly goes to Amitji to get his reaction. But that is what getting bitten by the Bollywood bug is all about - obsessiveness ;) Rekha did marry a very prominent Indian businessman but he ended up committing suicide. She has not married since then but has not closed the door on starring in another movie with Amitji - something that would be a miracle for fans of Bollywood. Oh no, who really cares for that real-life affair rumors. Even today, any Bolly actor-actress pairing is rumored to have an affair. Just any! It's a PR thing, solely; it even happens in the west. And even if Rekha might be worth an affair, i'd guess YRF just built up the rumors (with the consent of all actors including Jaya Bachchan) to create more stir for Silsila. Do judge the film without any unconfirmed real-life stories, please.